Hello to you all crafty peeps! 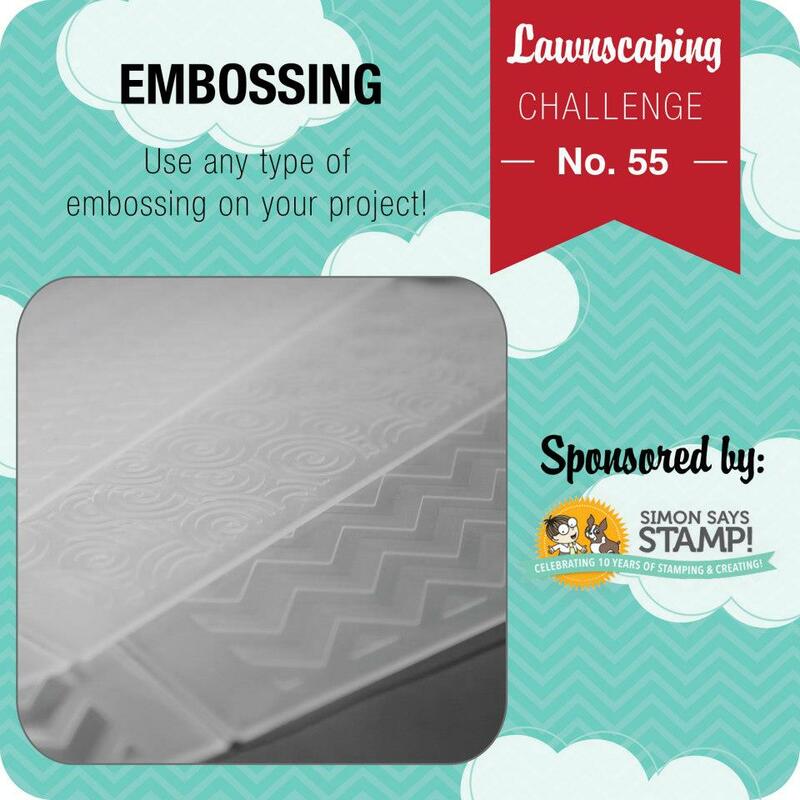 Today I am excited as I am sharing my card today as a Guest Designer at the Lawnscaping Challenge. I received an offer I couldn't and wouldn't turn down from the lovely Laurel. A lot of her time is being spent with her new precious bundle of joy, and she asked if I'd like to fill in as a designer. This challenge is all about embossing whether its heat or dry. I wanted to do something a bit different than the regular embossing. I first stamped my white card base with the small heart border from this Lawn Fawn set. 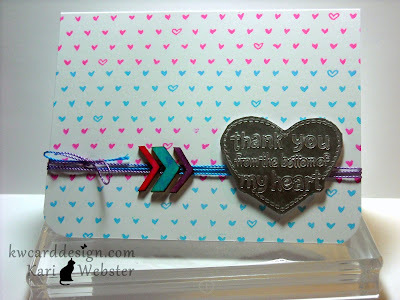 I stamped it in both Hero Arts Neon Inks in Pink, and Blue. I added some variegated floss from We R Memory Keepers in the blue/purple hue because when you mix both of the neon blue and pink inks you will get a purple color. Then, for my embossing part of the challenge - I took a scrap piece of white card stock and heat embossed 4 layers of silver embossing powder, and on the 4th layer while it was still warm, I took my heart thank stamp from this set, and pressed my stamp into the warm embossing powder and held it there until it cooled to create a "faux metal" embellishment. I love doing this technique - it is so fun - and its so "soothing" watching that silver embossing powder melt! I "fussy" cut out my heart and adhered it to my card base with foam adhesive. To finish off my card - I wanted to use my Studio Calico Chevron wood veneers, so I colored 3 of them with my Neon Inks, and adhered them onto my card with some Glossy Accents. Hope you all find this card inspiring!! Be sure to go play along at Lawnscaping! Such a pretty card! I love how you included a variety of elements...especially the faux metal heart! Awesome colors, too! Great card! So glad to have you guesting with us this month!